How to add more resources to an app? After reading this article you know when it makes sense to add more resources to your apps on Timekit and how it is done. While Timekit can work for you alone, it can sometimes be beneficial for your customers to have more options. Fx., by adding co-workers or more resources you can create things like Team Projects that pool availability from multiple resources and produce one project-widget for the entire team (eg. a sales team with multiple sales reps offering product demos). How to add more resources? The owner of the app needs to add resources from the "Resources" page. This is found by pressing "Resources" in the sidebar menu. From here you can add resources by pressing "Create resource" in the top right corner. You can choose two types of resources: Person & Item/asset. When you create a "person" you can set the password yourself or invite the person to do it via email. You need to enter name, email and set the timezone for the user (you can see how to format the time zone here). A resource without an email is called an "item" or "asset" in Timekit terminology and usually represents something that's not a real person. When you create a resource that is going to be powered by Google or Microsoft you have two options. If you know the resource's Google credentials you can connect the resource by pressing "Sign in with Google/Microsoft". If you don't have access to the resource but still want the person to connect directly with Google or Microsoft you can copy the link below and have them login and grant access to Timekit. How to add resources programmatically? Timekit also supports that you can "build resource creation" directly into you own app. 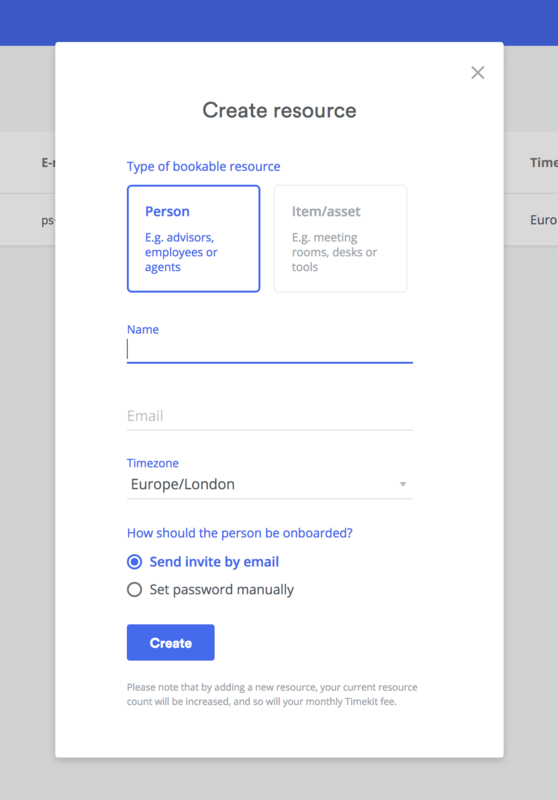 This makes sense specifically for those building larger marketplaces or applications where Timekit is powering the booking part of your application. Check out these articles on how to get started with Timekits API.